Kevin Green, once homeless, but now a multi-millionaire shares his steps to Wealth & Happiness in a simple format that can be applied to business start-ups and expansions. Kevin shares his life experiences and those of people he has helped to explain how you can easily follow the rules needed to achieve Wealth & Happiness in your life. Once you have received your book – remember to take a picture of you holding the book and post it on your social media with the #TheRichRules. 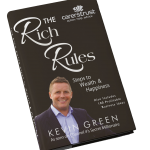 With all purchases of ‘The Rich Rules’ book we will donate 99p to Carers Trust, Carers Trust is a major charity for, with and about carers. We will also gift aid the donation to ensure that this amazing charity can benefit from the entire donation.